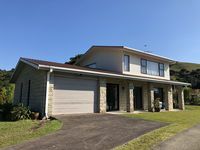 Properties in Wilson Bay average 4.6 out of 5 stars. Property 8: A hop, skip and jump from the door into the water! Property 11: Waterfront Vista in Wyuna Bay. Property 23: Bay Watch ~ Wyuna Bay ~ Stunning Harbour Views! Property 27: Fisherman/Family/Friends - Close to Beach & Township. WIFI and Sky TV. Beach Getaway with Stunning Ocean and Island Views - 70 meters from the Beach! Property 32: Beach Getaway with Stunning Ocean and Island Views - 70 meters from the Beach! Stunning Couples/Family Getaway with Panoramic Ocean, Islands & Mountain views. Property 33: Stunning Couples/Family Getaway with Panoramic Ocean, Islands & Mountain views. We stayed for 2 days during the easter weekend. Bach was kept tidy and clean. Beautiful sea view from the living room. Its very warm inside. Angela the owner was very friendly and response promptly for your queries. We thoroughly enjoyed the stay and definitely recommend. 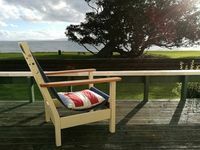 Bach is very close the coromandel town and beach is in walkable distance.